responsibilities, flex filed definitions, various guides and library functions. § Register custom Application components. 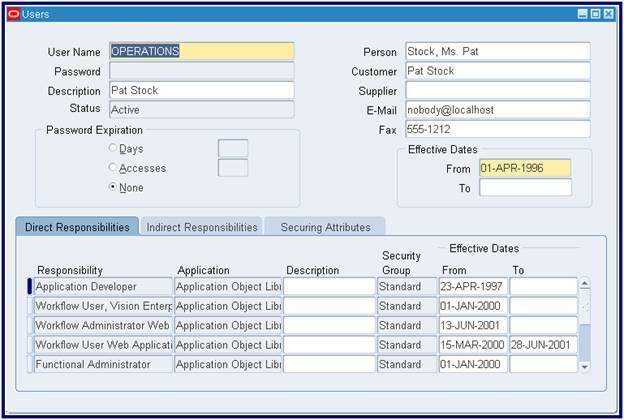 § Understand the security authorization features of Oracle Applications. 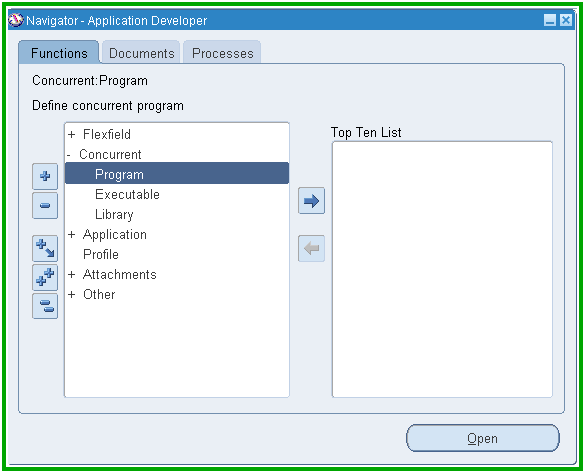 § Run concurrent programs using Standard Report Submission. § Design and implement Key and Descriptive Flex fields. 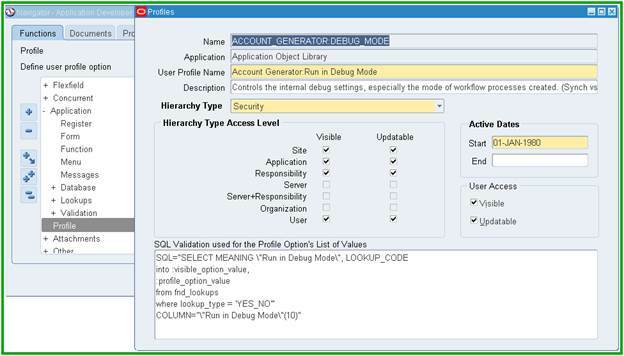 § Define and modify user profile options. § Setting Up Your Application. § A function is a part of an application functionality that is registered under a unique name for the purpose of assigning /excluding it from a responsibility. § Application developers register functions when they develop forms. 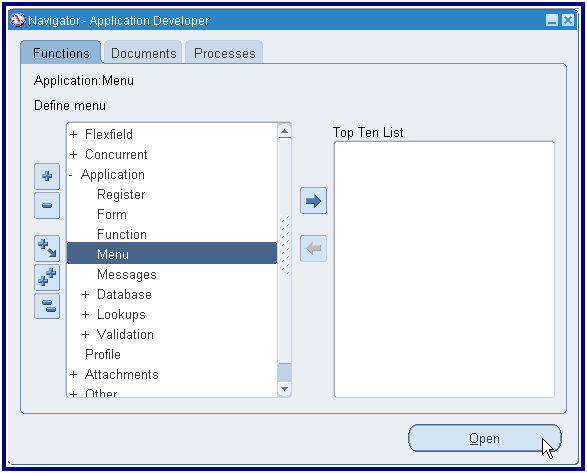 § A menu is a hierarchical arrangement of application functions that is displayed in the navigator window. § A menu consists of menu entries, which could be a submenu or a function. 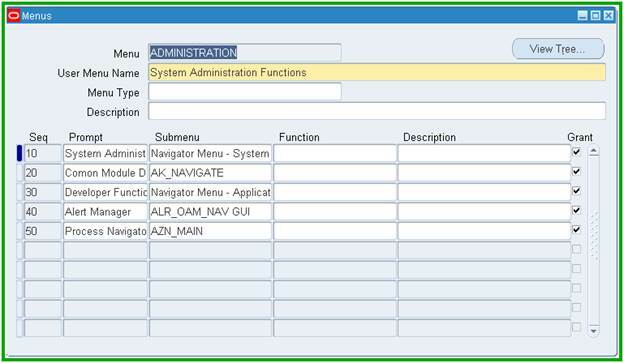 § Form functions are selected and navigated to using Navigator window. § Each responsibility has a menu associated with it. § Note the Menu name associated with a responsibility. § Query the menu name to find the menu entries. § Add your functions as menu entries here or create a new menu with your functions and add that as a sub- menu here. 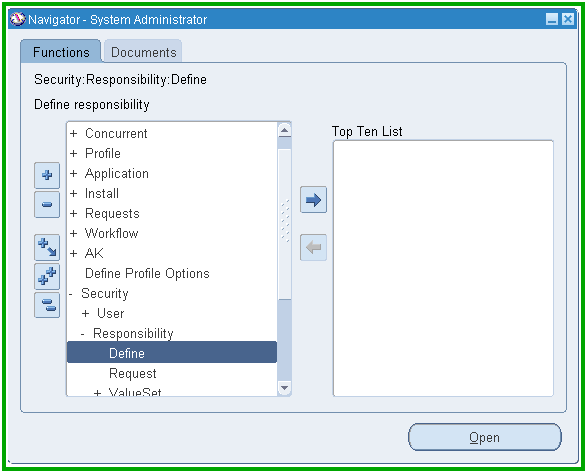 § Now you switch the responsibility and check whether your menu entry is appearing in corresponding responsibility. 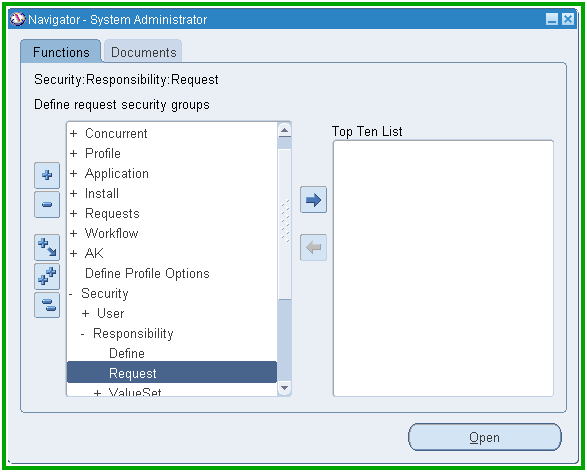 Concurrent Program Name, Responsibility Name and User Name for a concurrent request id? § A concurrent program is an executable file that runs simultaneously with online operations and with other concurrent programs. § We need a concurrent program for ..
§ The various steps to define and register a concurrent program are. 7. Run concurrent program through submit request form. § Enter a name for executable and short name. § Look for this file in that directory structure. Flex Rpt The execution file is written using the Flex Report API. Flex Sql The execution file is written using the Flex Sql API. Host The execution file is a host script. Oracle Reports The execution file is an Oracle Reports file. PL/SQL Stored Procedure The execution file is a stored procedure. SQL*Loader the execution file is a SQL script. SQL*Plus the execution file is a SQL*Plus script. SQL*Report the execution file is a SQL*Report script. Spawned The execution file is a C or Pro*C program. Immediate The execution file is a program written to run as a subroutine of the concurrent manager. § Enter the execution file name without the file extension. § For PL/SQL stored procedures enter the <package>.<procedure name> in the execution file name. This procedure must have 2 out parameters of type varchar2 preferably with names errbuf and errout. These two parameters should be added before adding any other parameters. § Choose an executable created, which will be executed once this concurrent program is scheduled to run. PCL (HP’s Printer Control Language). § The parameters are the placeholders for the input values to a concurrent program. § For PL/SQL stored procedures these parameters are passed to the program by position. § Note the Request group name for the responsibility, with which you want to attach the concurrent program. § Query the request group and add your concurrent program to the group. § A request group is a collection of reports and concurrent programs. § A system administrator defines request group in order to control user access to reports and concurrent programs. § Then use SRS (Standard Report Submission) form for running and monitoring your application’s reports/concurrent programs at specific time interval. 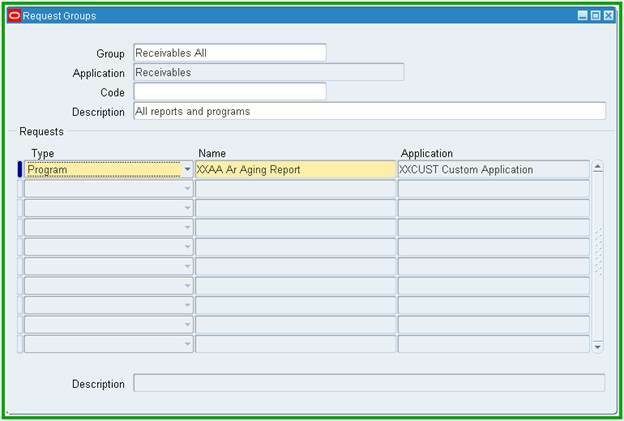 § This lets user specify run and print options and parameter value for reports and concurrent programs. § Use fnd_file.put_line(fnd_file.log, ‘any message’) to show message in conc program log file. ü Inactive Request cannot be run. Within each phase, a request’s condition or status may change. Below appears a listing of each phase and the various states that a concurrent request can go through. · Normal: Request is waiting for the next available manager. · Standby: Program to run request is incompatible with other program(s) currently running. · Scheduled: Request is scheduled to start at a future time or date. · Waiting: A child request is waiting for its Parent request to mark it ready to run. · Normal: Request is running normally. · Paused: Parent request pauses for all its child requests to complete. · Resuming: All requests submitted by the same parent request have completed running. The Parent request is waiting to be restarted. · Terminating: Running request is terminated, by selecting Terminate in the Status field of the Request Details zone. · Normal: Request completes normally. · Error: Request failed to complete successfully. · Warning: Request completes with warnings. 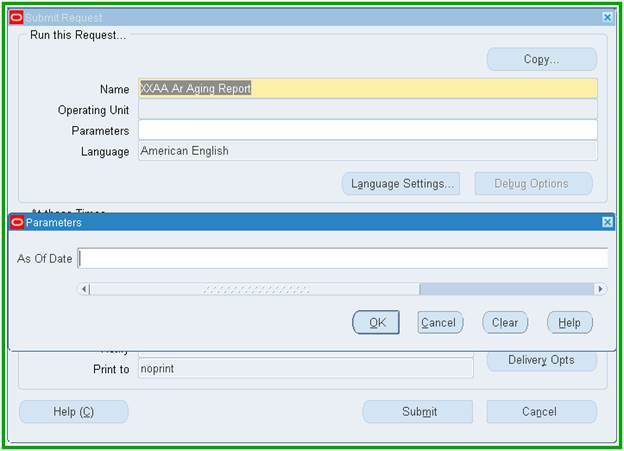 For example, a report is generated successfully but fails to print. · Cancelled: Pending or Inactive request is cancelled, by selecting Cancel in the Status field of the Request Details zone. · Terminated: Running request is terminated, by selecting Terminate in the Status field of the Request Details zone. · Disabled: Program to run request is not enabled. Contact your system administrator. · On Hold: Pending request is placed on hold, by selecting Hold in the Status field of the Request Details zone. · No Manager: No manager is defined to run the request. Check with your system administrator. § Request Sets are a method of grouping multiple reports and/or concurrent programs by business function with common run and print options. § The various tasks of the request set are linked together to determine the execution order, whether the tasks execute sequentially or in parallel. 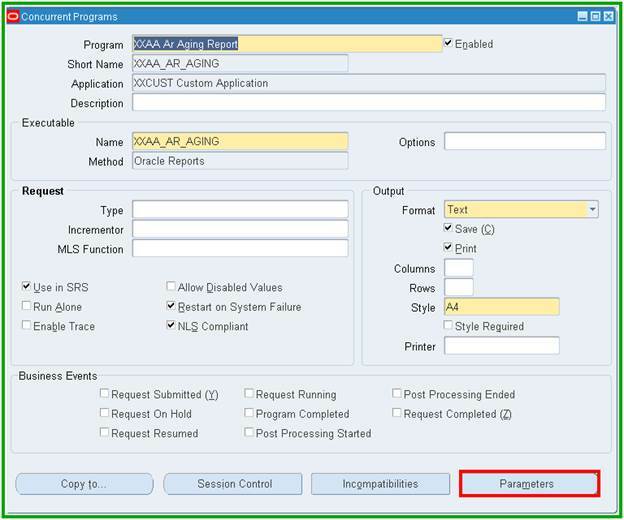 § Stage is a component of a request set used to group requests within the set. All requests in a stage are run in parallel, while stages themselves are run sequentially in the set. § Tasks that must operate separately are created in different stages. § After defining the initial stage for execution, all subsequent stages are defined under the three completion status codes for the previous stage. § Add or query a User. § Add responsibility to user as required. ”PAD–NR–YEL–8 1/2x14” indicating a notepad, narrow–ruled, yellow, and 14” by 8 1/2”. § A Flex field is a field which is made up of segments. § Each segment has a name and a set of valid values. § A Key flex field identifies an entity. 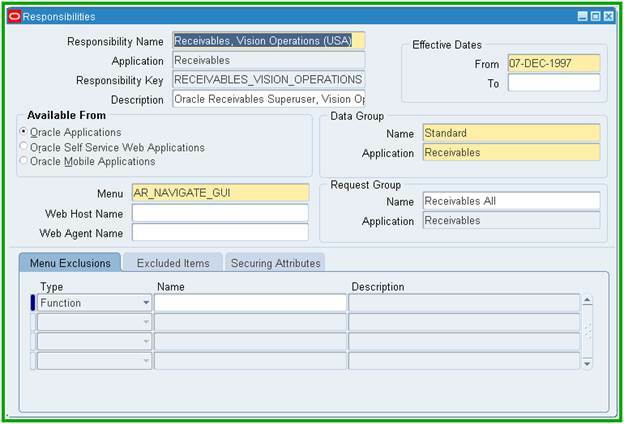 § Register your key flex field with Oracle Application Object Library. § Each key flex field has one corresponding table, known as the combinations table, where the flex field stores a list of the complete codes, with one column for each segment of the code. § There is a corresponding unique ID number (a code combination ID number or CCID) for that code which is also stored in the combination table. § A flex field structure is a specific configuration of segments. Same flex field can have multiple segment structure. § A segment is a single sub–field within a flex field. You define the appearance and meaning of individual segments when customizing a flex field. 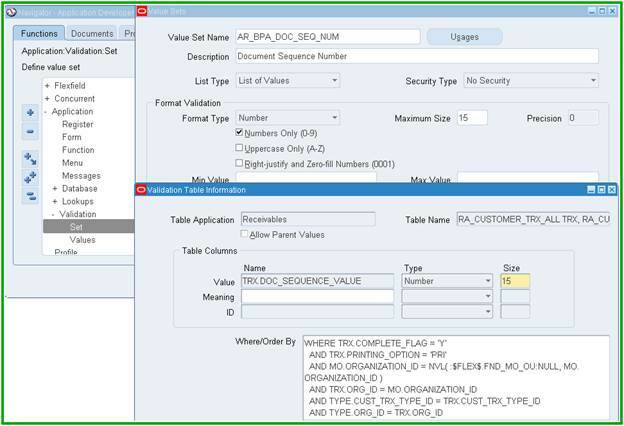 § A segment is represented in your database as a single table column. § A flex field qualifier identifies a particular segment of a key flex field. § The insertion of a new valid combination into a combinations table from a form other than the combinations form. 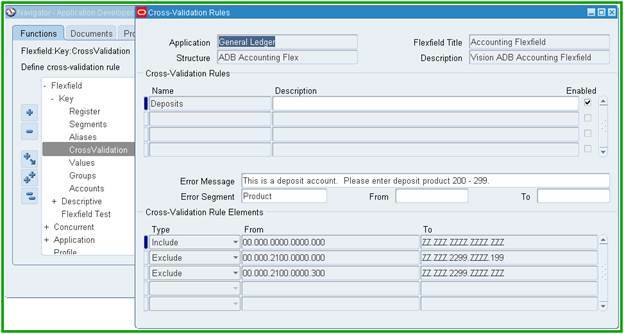 § Cross–validation rules prevent users from creating new key flex field combinations that contain values that should not coexist in the same combination. 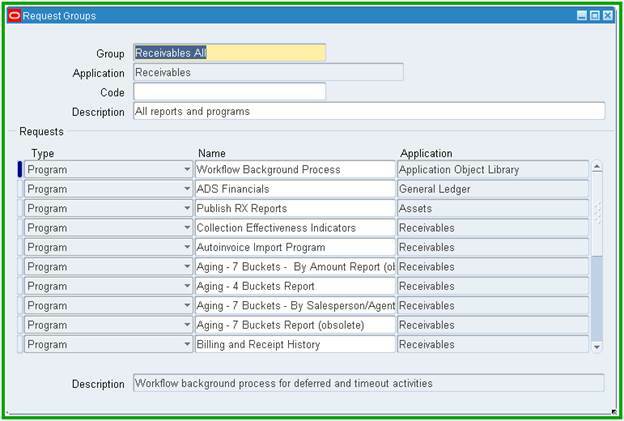 § Descriptive flex fields provide customizable "expansion space" on your forms. You can use descriptive flex fields to have additional information, important and unique to your business that would not otherwise be captured by the form. § A descriptive flex field appears on a form as a single-character, unnamed field enclosed in brackets. § Descriptive flex fields have two different types of segments, global and context-sensitive. 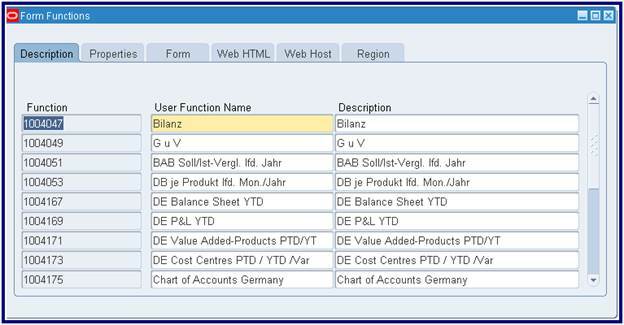 § A global segment is a segment that always appears in the descriptive flex field pop-up window. § A context-sensitive segment is a segment that may or may not appear depending upon what other information is present in your form. § Go to Global Data Elements context field. § Click segments to view the DFF segments. § Save and compile the flex field definition. § Navigate to Order Management, Enter orders screen. § The DFF data gets stored in attribute columns of the base table. 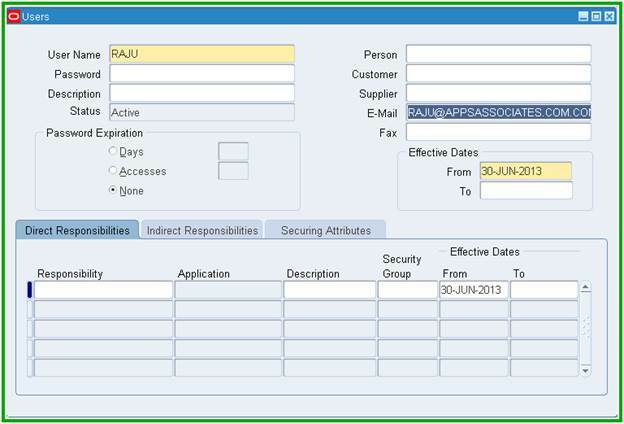 § A context-sensitive descriptive flex field can gather context information from either a field on the form, or from a special field (a context field) inside the descriptive flex field pop-up window. § If the descriptive flex field derives the context information from a form field, that field is called a reference field for the descriptive flex field. § In DFF Segments form check Displayed for the context. § Choose the reference field from LOV, which should be initially defined in Register DFF form. § The reference field is same as a normal form field. § Reference fields provide a way to map the context-sensitivity of descriptive flex field information that has been captured to existing conditions in your business data. § If you use a reference field, the value of that field populates its own column. For example, if the reference field on the form is the "Country" field, it populates the "country" column in the table. § However, the reference field value also populates the structure (context) column in the table, since that value specifies which structure the flex field displays. 1. 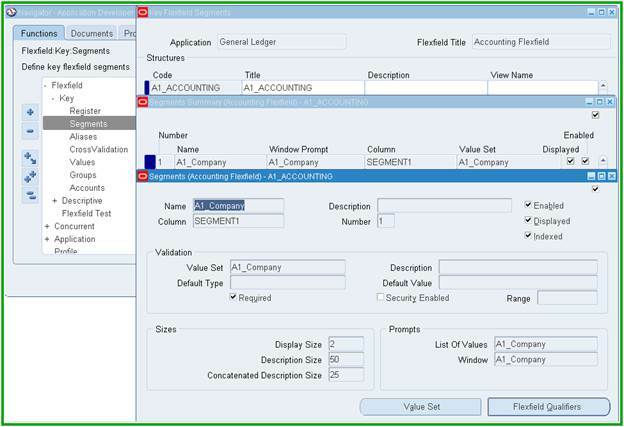 Customize your applications to conform to your current business practice for accounting codes, product codes, and other codes. 2. Customize your applications to capture data that would not otherwise be tracked by your application. 3. Have “intelligent fields” that are fields comprised of one or more segments, where each segment has both a value and a meaning. 4. Rely upon your application to validate the values and the combination of values that you enter in intelligent fields (Cross Validation Rules). 5. 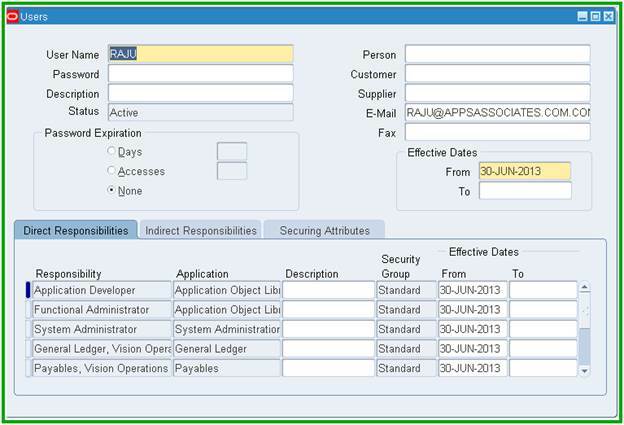 Have the structure of an intelligent field change depending on data in your form or application data. 6. Customize data fields to your meet your business needs without programming. 7. Query intelligent fields for very specific information. 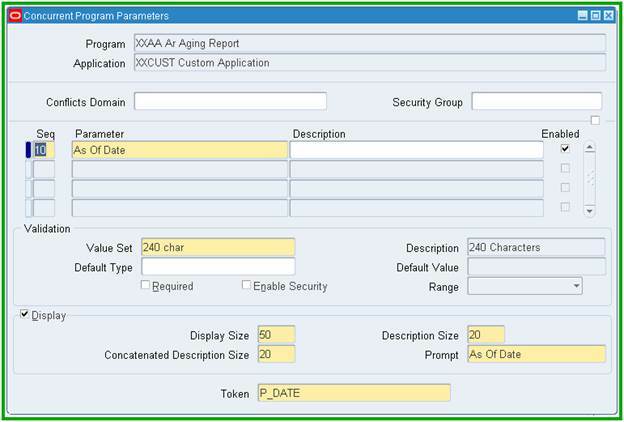 § Determine which values users can enter into flex field segments and concurrent program parameters. 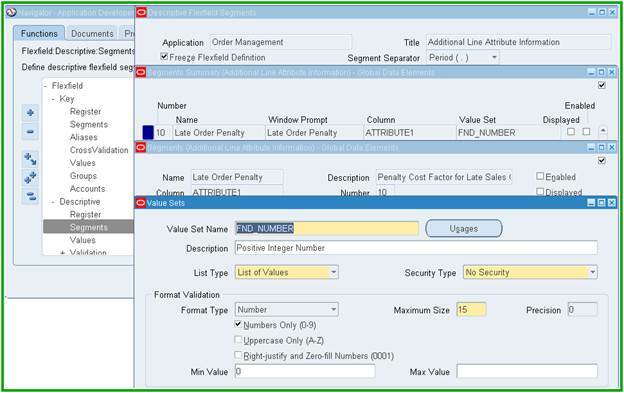 § Define your flex field structure to use that value set for a segment. § Create a value set with a name, format type and length. § Enter the Application name (optional), table name. § Enter where and order by clause as appropriate. • Define your dependent values. 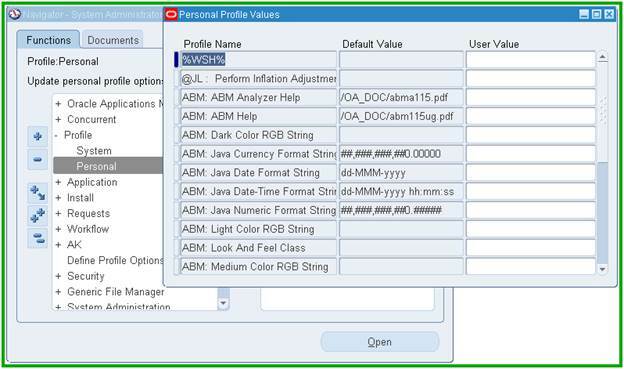 § You need to create a profile in Application Developer responsibility and then assign its system and personal values. § A profile option cannot be deleted. • Click on Menu Edit -> Preferences -> Profile. 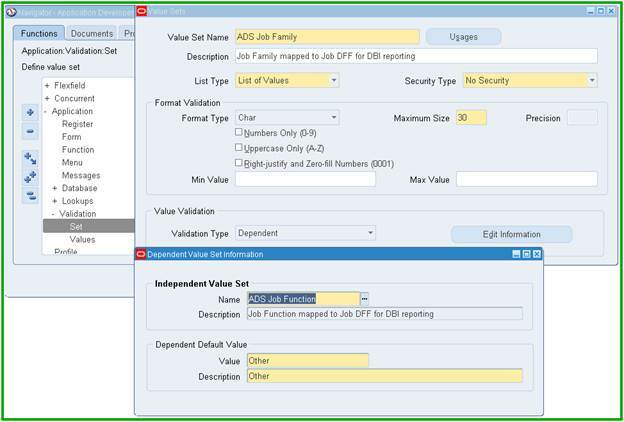 § A value set at the higher level overrides the one set at the lower level. “User” is the highest level. § Option values are dynamically set at the run time. 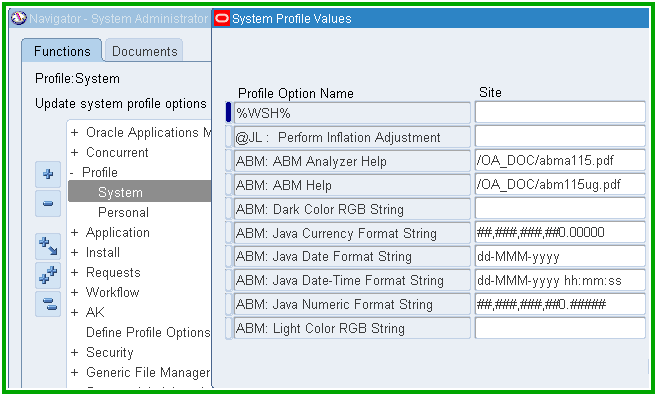 • FND_PROFILE.GET (name IN varchar2, value OUT varchar2) is a procedure. • FND_PROFILE.VALUE (name IN varchar2) return varchar2 is a function.